In my last post, I showed off some of autumn's colour in Leavenworth, Washington. On Saturday we drove to Spokane and attended the wedding of a young man we knew from Ecuador. It was great to see old friends again, the kind of friends one can pick up a conversation with no matter how long we've been apart. These photos were mostly taken while driving, so they are, literally "from the road." This morning (Sunday), we left Spokane shortly after 8 am, headed for home. We drove through flat lands covered with shape-shifting fog from which emerged old barns and deserted homes, ghostly trees, and a few scattered tidy farms. After 90 minutes or so, the fog lifted and a sere, stark, uninhabited landscape revealed itself. As we drove down into the deep coulee, rock walls stood like sentinels along the edges of what appears to be a dry lake or enormous river. When we stopped for gas, I noticed this large painted sign on the side of a barn. I wonder just what the "Golden medical Discovery" was? As we drove closer towards the mountains, acres of fruit orchards stretched along either side of the highway, and colour lined the riverbanks. As we climbed towards Stevens Pass the road curved through rain and leaves that swirled around the car. Towards the summit (1240 metres) the rain changed to wet snow and although none of it stayed on the ground, the mountainside trees were white. I was driving during this time, so no photos were taken. We soon descended over the coast mountains and the rain stopped. As we neared the Canadian border dark clouds gathered and soon poured down again. We had hoped to catch the 3 pm ferry, but driving in the rain slowed us down and we arrived at the terminal just in time to see the 3 o'clock ferry pull away from the dock. Oh, well. Nothing to be done but make the most of it. We walked, ate a late lunch/early supper, and caught the 5 pm, arriving home just after 7. It was a lovely weekend, relaxing and enjoyable. I leave you with October leaves in the sunshine, from Friday's outing in Leavenworth. I hope your October has been as full of beauty as ours has. Linking with Mosaic Monday, hosted by Maggie from Normandy Life. This link up is number 107 for Maggie, and her last. She's passed the baton to another host who will begin next week. A huge thank you to Maggie for her expertise and graciousness in connecting bloggers through this link up. That's the thing I love about driving in the States/Canada -- wide open roads, ever changing scenery and weather conditions. Very Autumnal, jumping in the leaves! What fun. Even though the weather was unkind and the drive long and winding the scenery remains stunningly beautiful in it's starkness. I love the photo of you throwing leaves, so joyous! Thank you for being such a staunch supporter during my stint as MM host, I've thoroughly enjoyed the last two and a bit years and will continue to participate when Angie takes over next week. What a change in the landscape as you drove along! Have a great week. Hi, a lovely selection of photos. I particularly liked the misty trees in the first one. The sign on the barn was interesting and oh those beautiful colours of the trees by the water. Sunshine or not you take the best road trips and you make even bleak scenery interesting. Really enjoyed seeing your road trip photos! Gorgeous. So glad you had a wonderful time. All the beauty surely fills the well of the soul refreshing it for a new week. 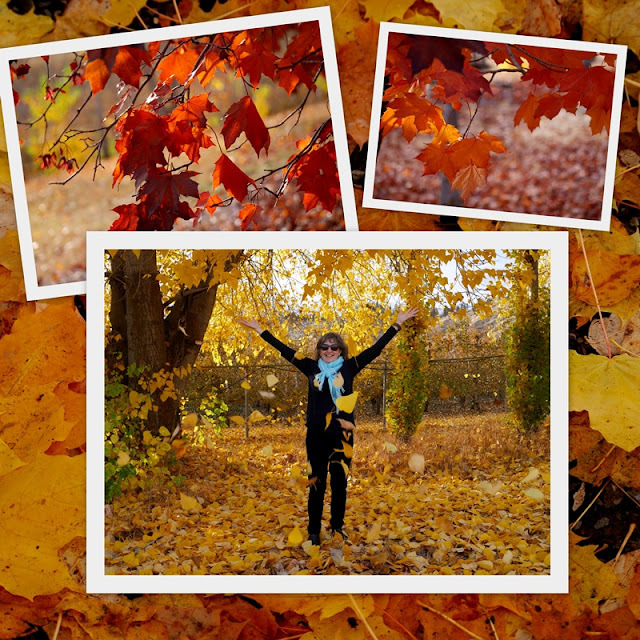 Loved your happy dance in the leaves, Lorrie!! I hope you have that photo printed....you in the golden leaves! How spectacular! And I love seeing those old barns along the way! It's wonderful to get a chance to travel...with a camera at the ready! Enjoy your week! Glorious pictures of October! Absolutely stunning! Loved seeing your photos from the road and from Leavenworth. You got some amazing fall color shots. Beautiful. Glad you had a good trip and re-connected with old friends. It amazes me how the landscape can change in just a few miles. Gorgeous images of your drive. Friends like the ones you described are a blessing indeed. So nice to reconnect. Have a lovely week. Such an amazing photo of you in the leaves, a stunning mosaic. Beautiful photos from an exceptional area! Not sure my comments on the last post stuck, but our fall has been just amazing. Your pictures portray is beautifully. What a lovely quick trip. Thanks for taking us on the road with you. It was fun to see the contrasts in weather! Beautiful autumn photos at the end! The stark landscape and land erosion reminded me of a few places in Colorado. I am always amzed to see land like that. What a lovely trip - and especially to see old friends. I've taken photos of that same barn on our visit to Eastern WA - they certainly do maintain it well. We love the terrain - all those rock gorges and open areas - wonderful photos. Happy Autumn. I so enjoyed travelling along with you this morning. The scenery is so beautiful and I love the collage at the end. Great picture of you enjoying an autumn day. Fabulous pictures, and I love that mosaic. I love this post - the perspective of the photos - literally from the road - make it quite special. And, although we might always wish for blue sky days, some of the best pictures are on days when the weather offers mystery and intrigue. The mosaic at the end is a great way to close a colorful October, which has been glorious!!! Great views! The last one is full of autumn happiness - so cool. The mosaic of autumn leaves including a cheerful beautiful lady in the golden leaves is perfectly lovely. I also like the photos taken in the moody weather. My favorite is the 7th image. Thanks for taking us to this wonderful road trip. Such beauty! We've also enjoyed Leavenworth in Fall!